This bedazzled Farah Talib Aziz jacket has been a go-to for fashionistaâ€™s for a night out on the town! Alizeh sported hers at the fashion week red carpet recently, and we love her loose curls and dark lips, which give a glamorous look to the statement piece, and how she dared to go with slouchy pants. 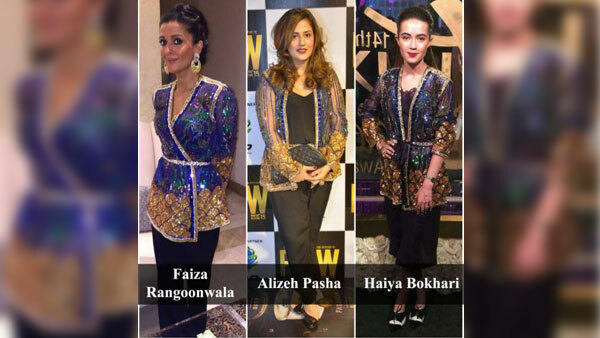 Haiya paired the jacket with brogues and culottes at the Lux Style Awards, staying true to her edgy sense of style. However, Faiza takes it home in this one, opting for bold statement earrings, a glam up-do and trendy flared trousers. FTA’s Cruise Collection 2017 Is A Must Have!